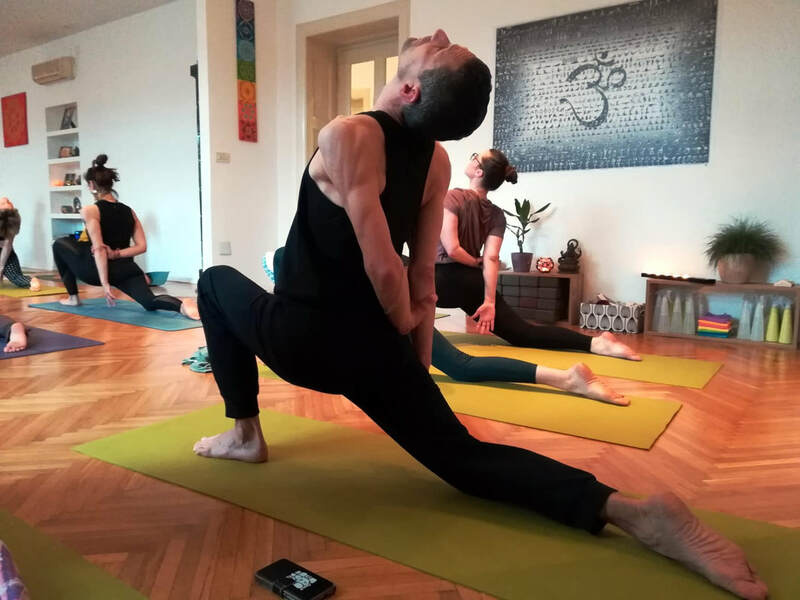 The Dharma Yoga Center Zagreb offers over 30 different yoga classes per week suitable for all levels, a Yoga Shop with everything you need for yoga practice. 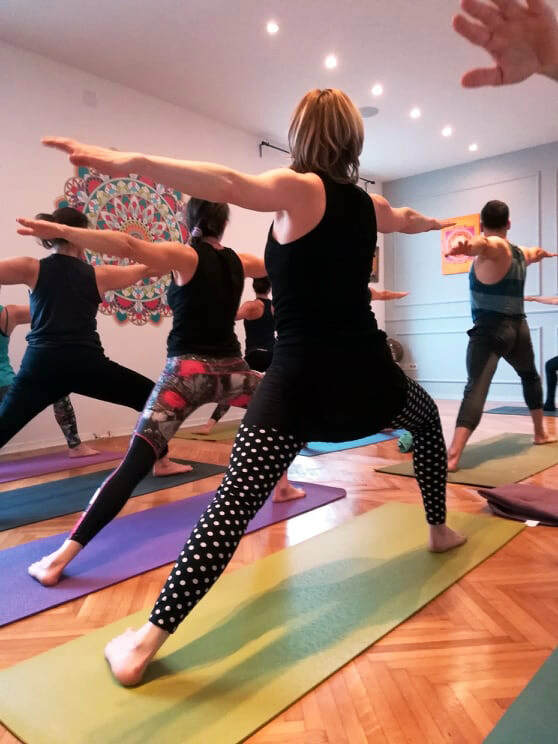 In the beautiful space with warm, welcoming atmosphere you will find everything you need for your practice and a rich program that meets all aspects of yoga and is appropriate for each age and ability (from absolute beginners to advanced practitioners, and yoga for the elderly). Our wide range of classes will allow you to practice yoga that suits your needs at any hour proposed on our regular schedule, according to your monthly membership, or just on the "drop-in" basis. ​All our yoga classes are tailored to students’ levels and are taught by highly qualified and experienced teachers, guided on English as needed. Here, in Dharma you can find the time to get in touch with your body, mind and soul through yoga. Our mission is to help others reach a greater sense of self awareness, happiness and inner peace by sharing our knowledge through yoga! ​We are here to serve and accommodate you in all possible ways, so feel free to email us with any questions you may have. Our teachers specialize in the practice of traditional Hatha-Raja yoga in the lineage of Sri Dharma Mittra. ​Below are descriptions for all Dharma Yoga classes and workshops to help you decide which ones are suitable for you. Every class is available to all students, but it is suggested that you choose the level that is most appropriate for you, so as to receive the maximum benefit. are challenging and physically absorbing vinyasa series created by Sri Dharma Mittra. They reintegrate the flow of prana throughout the spinal column and facilitate the movement of the vital life force deep into all areas of the physical, metabolic, intuitive and bliss bodies. This promotes harmony within all these layers so a concentrated state of radiant health is achieved. The highest crowning meditative asanas,pranayamas (breathing techniques), and Yoga Nidra (psychic sleep), which are embedded in the deep roots of Sri Dharma Mittra's teachings, are also imparted to the students. A detailed regimen for yoga initiates designed to ease the body into wakefulness and prepare for the stresses of the day. A program designed to help you tone your body and relax your mind. Includes warmups, basic poses, and stretches. For beginners of all ages. FEELING STRONGER EVERY DAY: A combination of different strengthening, conditioning, and calming techniques. Achieve a better posture, immune system, muscle tone, circulation in addition to a calmer outlook. ​Learn the fundamentals of the yoga experience with other absolute beginners. You are slowly guided through various yoga postures, breathing techniques, and alignment principles. In each class a new element is added. This is the beginning level of the Dharma Yoga series. Students will practice DY Surya Namaskar Vinyasa and be introduced to DY Shiva Namaskar Vinyasa Level I to warm up the body, bring flexibility to all muscles and joints, and wake up the nervous system. A gentle yet powerful series of balancing, stretching, back bending, twisting and mild inverted postures will follow. This practice ends with Deep Relaxation, breathing exercises, and concentration/meditation to remove impurities and bring a sense of well-being to the body and radiant peace to the mind. This practice builds on the fundamentals of Dharma I, and is designed for those wishing to advance in posture practice. Dharma II will ignite the entire bodily system through practice. A series of deeper balancing, stretching, back bending, twisting and inverted variations will be taught, including the Headstand, King of Postures. This practice finishes with Deep Relaxation, breathing practices, and concentration/meditation, which will induce deep calm and simultaneously invigorate the students. This intermediate practice builds on the teachings of Dharma II, and is designed for those wishing to move advance through our progressively challenging asana practices. Dharma III will ignite the entire bodily system through practice, unleashing the life force within it. With regular practice, weight problems and disease become a thing of the past, as one attains good health and increased stamina, and gains the opportunity to attain Self-realization. The balancing, back bending, twisting and inversion variations increase in difficulty. Special meditative Headstand and Shoulderstand practices are introduced. This practice finishes with Deep Relaxation, breathing exercises, and concentration/meditation certain to bring a deep sense of calm, increased sense of balance, peace, and invigorated energy to all students. This intermediate to advanced practice builds on the teachings of Dharma III, and is designed for those wishing to move advance through our progressively challenging asana practices. Dharma IV will ignite the entire bodily system through practice, unleashing the life force within it. With regular practice, weight problems and disease become a thing of the past, as one attains good health and increased stamina, and gains the opportunity to attain Self-realization. The balancing, back bending, twisting and inversion variations increase in difficulty. Special meditative advanced inversions are introduced. This practice finishes with Deep Relaxation, breathing exercises, and concentration/meditation certain to bring a deep sense of calm, increased sense of balance, peace, and invigorated energy to all students. Class include traditional pranayama sequences, 24 Surya Namaskar, 8-10 main poses and deep healing relaxation. Hatha yoga classes are designed to give you time to slow down and practice the tools of yoga. A session includes meditation, pranayama (breathing exercise) and asana (poses) which will empower you to thrive off the mat. In Hatha yoga, you’ll build an awareness of body and mind, connecting both aspects of yourself for an enriched well-being. Class is beginner friendly, all levels welcome. This class is open to a mixed level of students. Based on the teaching and practice of beloved yoga master Sri Dharma Mittra, this class reintegrates the flow of prana through the spinal column and emanates deep into all areas of the physical, metabolic, intuitive, and bliss bodies. Sounds magical doesn’t it? It gets better! The deep roots of Dharma’s teachings are passed onto the students during a strong physical sequence concluded with a short meditation practice. The physical sequence includes balancing, twisting, stretching, back bending and inversions as well as relaxation- the best antidote for impurities, disease and illness. Class includes a Dharma Talk on practical and spiritual philosophical methodology, varied discourses on karma and reincarnation, yogic diet, as well as classical breathing techniques. This is a Mixed Level Dharma Yoga practice that gives one a very real experience of the classical yoga teaching that has made Yogi Sri Dharma Mittra in such demand as a teacher the world over for so many years now. Those new to yoga and those who already have an established practice will all find much to inspire them in this complete online yoga practice. Maha Shakti is primarily asana (yoga postures), but what's on offer here represents a complete practice including both guided Deep Healing Relaxation and a final meditation. This program is an excellent introduction for those new to Dharma Yoga. Overall, a well-rounded and complete yoga practice. "I look forward to serving you only the best of the best," says Sri Dharma Mittra. Classes inspired with Dharma yoga levels. ​Both Hatha and Vinyasa yoga work to increase flexibility and strength, improve breathing and quiet the mind. Strengthen the Body, Calm the Mind, Open the Heart. A Hatha Flow class is taught with unique sequencing to promote a dynamic + relaxing experience. This class incorporates all aspects of a traditional Hatha yoga class – breath, meditation and postures – while challenging your co-ordination through movements. Pranayama is one of the basic practices of yoga, though it is often neglected in exercise based yoga classes as taught in gyms and fitness centers. Prana means energy, life force or breath. Yama is translated as restraint, or control. When we work with our breath, we gain access to our life force energy.Pranayama is traditionally thought to be a much more powerful practice than asana and therefore some systems of yoga don’t introduce pranayama until some mastery of asana is attained. However, basic pranayama is accessible to the most beginner student, even those whose physical impairments and injuries prevent most asanas. In addition, pranayama is an access point to the subtler aspects of yoga and is tremendously helpful in developing body awareness, mindfulness, focus and stamina. Psychic Development is a specific course of Yoga techniques to use the higher mind to achieve your life's goals and successfully fulfill your destiny. Everything is created in thought form before it manifests into the material world. Therefore thoughts precede physical action. When mental projection techniques are employed through psychic development, we avoid wasting time in misguided actions due to the interference of the lower mind. Psychic Development is about using the higher mind (the metaphysical mind), honing and wielding it like a machete in the jungle to cut through the myriad problems of the lower mind and weak, uncreative thoughts, using the higher mind instead to manifest your thoughts. It allows us to fulfill our duties and responsibilities as well as achieve life's highest goals. Yogi Gupta (Guru of Sri Dharma Mittra) was the first to bring these techniques and teach this most useful course in the USA for the benefit of mankind.